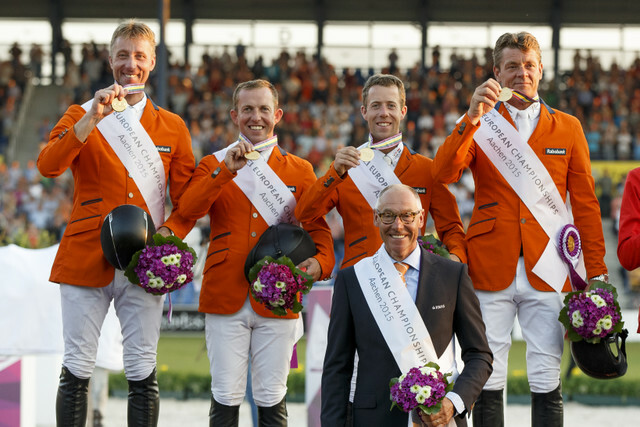 Aachen, (GER)- The reigning world and Furusiyya FEI Nations Cup™ champions from The Netherlands clinched team gold at the FEI European Jumping Championships 2015 in Aachen (GER) today as Jur Vrieling, Gerco Schroder, Maikel van der Vleuten and Jeroen Dubbeldam with Chef d’Equipe Rob Ehrens celebrate team gold Lying second as the day began, they produced another of their trademark foot-perfect performances to put the result beyond doubt when the leading French squad faded to fifth. And it was the host nation who slotted into silver medal spot ahead of the surprising Swiss who moved up four places to take the bronze. The result of today’s competition also decided the last three Western European qualifying spots for the 2016 Olympic Games. Switzerland, Great Britain and Spain finished best of the non-qualified eligible nations and are on their way to Rio. None of the 13 individuals who opened today’s action managed to leave all the poles in place, but they showed that the imposing fences were very jumpable. And once the team action got underway it turned into a ding-dong battle between the major contenders, with the Swiss making an incredible come-back thanks to two clear rounds. 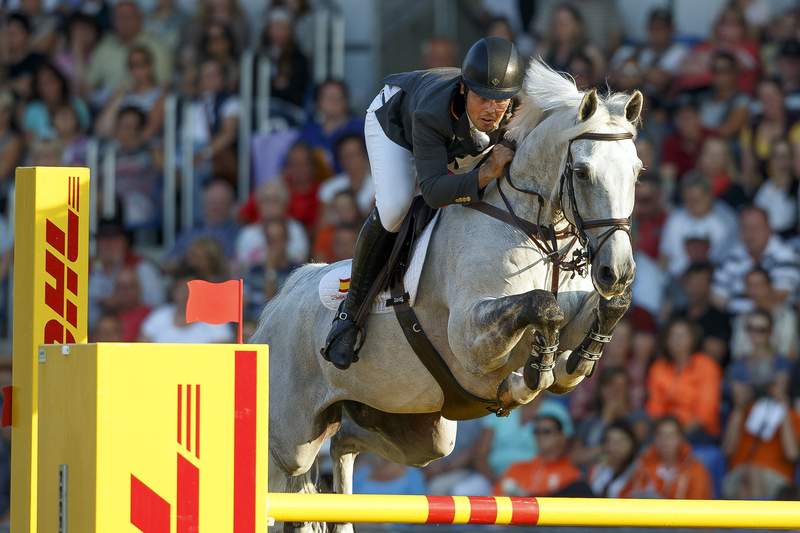 Only 10 fault-free results were registered, and when the Dutch added just a single time fault to their tally they were already looking good before last-line rider, Gerco Schröder, took his turn. The black wavy planks at fence four was one of the bogeys of the track, and the massive triple combination that followed was also hugely influential, with the opening triple bar enticing horses down to a tall vertical and often leaving them very deep at the final oxer element. And the difficult four or five-stride distance between the big 1.80m-wide oxer at fence eight and the following planks claimed a large number of victims. Many horses showed better form than they had all week, however, and the fifth-placed Swiss began their climb to the medal podium with an opening clear from Romain Duguet and his mare, Quorida de Treho. Ukraine lay ahead of them as the competition began and Cassio Rivetti’s clear with Vivant got them off to a great start. That pattern continued with a fault-free run for British openers Ben Maher and Diva, Germany’s Meredith Michaels-Beerbaum with the fabulous grey, Fibonacci, and Dutch double world champion Jeroen Dubbeldam with SFN Zenith NOP. When Penelope Leprevost’s Flora de Mariposa hit the bogey wavy planks the French began to look a little vulnerable. And the British couldn’t improve their situation with single errors from Jessica Mendoza (Spirit T) and Joe Clee (Utamaro D’Ecaussines). Germany held firm with another clear from Christian Ahlmann (Taloubet Z), but the Dutch stayed out in front when Maikel van der Vleuten and the always-reliable VDL Groep Verdi cruised home once again without incident. The French meanwhile were in rapid decline, paying a high price for Simon Delestre’s (Ryan des Hayettes) mistake at the final element of the triple combination and the double-error from Jerome Hurel (Quartz Rouge) at the wavy planks and the second element of the double of water ditches, one fence from home. By the time Jur Vrieling entered the ring, the door was wide open for the Dutch if the third-line rider could produce a clear round. But he winced when he saw a single time penalty on the board after an otherwise perfect tour of the track, because if Ludger Beerbaum’s four-faulter with Chiara could be discounted by a clear from Daniel Deusser then the Germans had the advantage and all the pressure would be on the final Dutch duo of Gerco Schröder and Glock’s Cognac Champblanc. You could hear a pin drop when Deusser entered the Soers arena, but there was a huge groan when Cornet D’Amour left the oxer at eight on the floor. The home side would now finish on a final score of 12.40, while the Dutch were already home and hosed with their total of 8.82, Gerco Schröder’s eight-fault effort having no effect on the end result. The Swiss meanwhile came with a late run. Duguet’s opening clear was followed by nine faults from Martin Fuchs (Clooney) and four from Janika Sprunger (Bonne Chance CW), but it was the clear from Paul Estermann and Castlefield Eclipse that would secure the bronze on a final total of 18.23. Dutch Chef d’Equipe, Rob Ehrens, who has led his country to great glory in recent years, was asked this evening if he has a magic formula for success. “There is no magic formula, in our small country we just work really well together and it only takes half a minute to call riders and get them in position for nations cups or championships. It’s a great honour for me to work with four of those amazing riders, with their amazing horses and the amazing people behind our team. And we have four more riders banging on the door at home. I’m a happy coach! 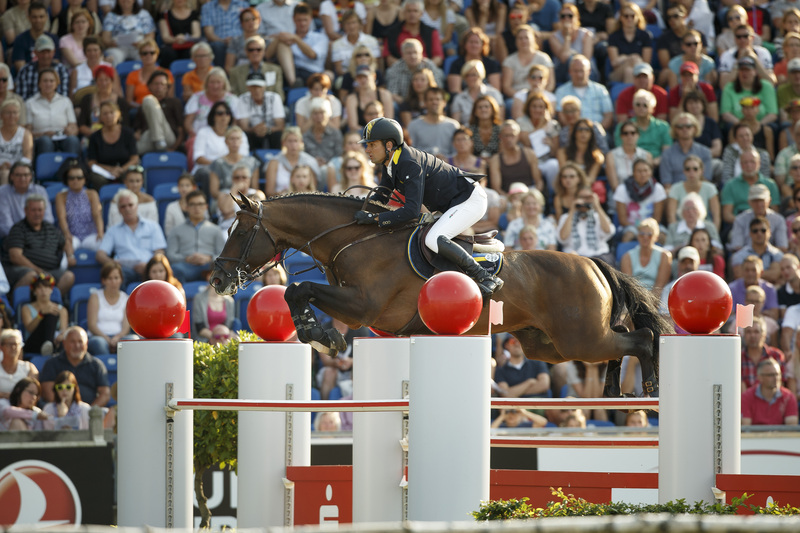 To perform like this in Aachen, well we hope you will make more Championships in Aachen!” he said. Double world champion Jeroen Dubbeldam, talked about the way the competition unfolded today and the pressure of being first to go for his side. “All four rounds were important, all four were in a difficult place in every round and had the pressure, my job was to go clear and keep up the spirit, to give the inspiration to keep going. It was a really tough course today. There were already three or four clears before I came in and that put pressure on me. I felt a lot of pressure, but my horse gave me an amazing feeling and the confidence for a clear round, and that gave the spirit to the rest of the team”, he said. Asked how he felt about his team’s silver medal finish, German Chef d’Equipe Otto Becker said, “at first I was a little disappointed, but we tried hard and the team did great, all four horses and all four riders, there was not one bad round. It was a big fight and we tried very hard. I agree with Rob (Ehrens), there should be more championships in Aachen, but without the Dutch!”, he added with a laugh. “Last year in Caen (Alltech FEI World Equestrian Games™ 2014 in Normandy) and in Herning (FEI European Championships 2013) the competition was really close, but it couldn’t have been closer than in these last few days”, Ludger Beerbaum said. “There were emotional ups and downs. To be careful of your fences every moment and not get distracted by other things. It’s hard when you don’t make it, all four of us over three days had really good rounds, but we must accept the situation, there are days like this, and congratulations to the Dutch!”, said one of the world’s most popular and respected horsemen. The individual scoreboard underwent a major shake-up today, with Spain’s Sergio Alvarez Moya shooting up from fifth to the gold medal spot ahead of Ukraine’s Brazilian-born Cassio Rivetti in silver and the reigning world champion, Jeroen Dubbeldam, in bronze. Switzerland’s Romain Duguet lies fourth while Frenchwoman Penelope Leprevost has dropped from first to fifth ahead of Sunday’s individual medal-decider in which riders carry their faults from the previous three days of competition. 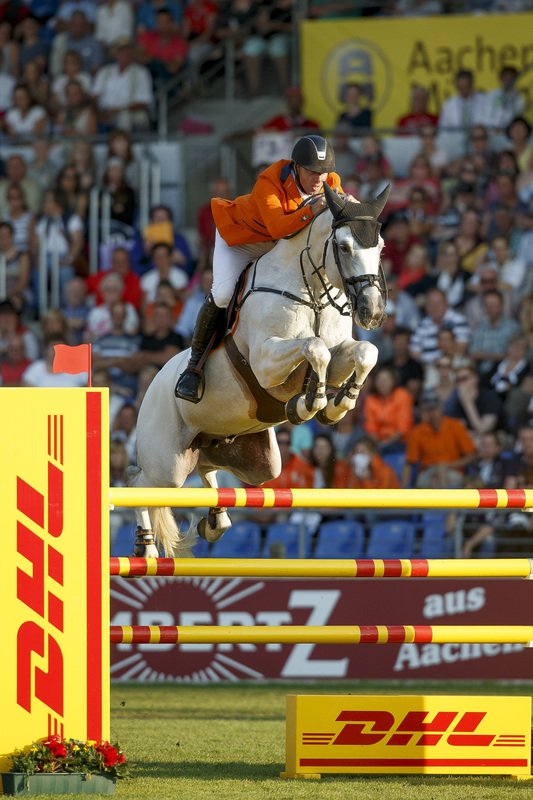 For more information on the FEI European Championships 2015 in Aachen visit www.aachen2015.de. Skovley's Appel Jack - Fantastic Danish Gelding schooling all Grand Prix!